CBS has revealed the participants for the upcoming 14th season of their venerable reality series, Big Brother. The show debuts on Thursday, July 12th. This time around, the housemates will include the brother of Survivor’s Russell Hantz, a model, and four top players from previous seasons. The latter will be revealed during the season premiere. BIG BROTHER welcomes 12 new Houseguests for the 14th installment of the CBS reality series which premieres Thursday, July 12 (9:00-10:00 PM, ET/PT) on the CBS Television Network. Julie Chen is the host. In a series first, four of the most successful players to ever enter the BIG BROTHER house, will return to play their own game and for their own separate prize. The identities of the four returning players and details surrounding their mission inside the house will be revealed during the season premiere. Current City: New Orleans, La. 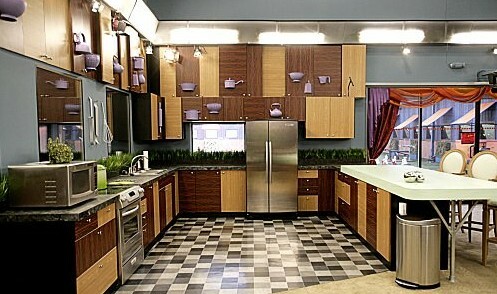 This season, the Houseguests will enjoy bright colors in the BIG BROTHER house which is styled in urban pop culture décor. The contemporary living room features three-dimensional, white “wave wall” covers, which are accented with rainbow-colored, custom designed wall paper and a 12-foot tall abstract sculpture composed of steel, plexiglass and light. The kitchen’s white, open cabinets showcase pops of bright colors inside. The Houseguests will have an opportunity to slumber in the Kicks Bedroom, featuring a wall of sneakers; the Sonic Flow Room, which is decorated with various headphones, a boom box and headphone shaped beds; or relax in the bird themed bedroom. Other highlights from this season’s BIG BROTHER house include the Arcade Room; a Zen garden-inspired backyard; an “every city” skyline along the upstairs wall; and an oversized chess game. Following the premiere on Thursday, July 12 (9:00-10:00 PM, ET/PT), BIG BROTHER will be broadcast three nights weekly, beginning Sunday, July 15 (8:00-9:00 PM, ET/PT), Wednesday, July 18 (8:00-9:00 PM, ET/PT) and the LIVE eviction show, hosted by Julie Chen, beginning Thursday, July 19 (9:00-10:00 PM, live ET/delayed PT). BIG BROTHER follows a group of people living together in a house outfitted with 53 cameras and 98 microphones recording their every move, 24 hours a day. Each week, the Houseguests will vote someone out of the house. At the end, the last remaining House Guest will receive the grand prize of $500,000. What do you think? Does this sound like an interesting cast? Will you be watching season 14? My husband and I enjoy Big Brothers. We can’t wait until the new show starts. You would think but this particular one never seems to die, I think this is it’s tenth year unless I’m mistaken. More reality trash. Never watched the others; won’t watch this one. Hope it tanx quickly.